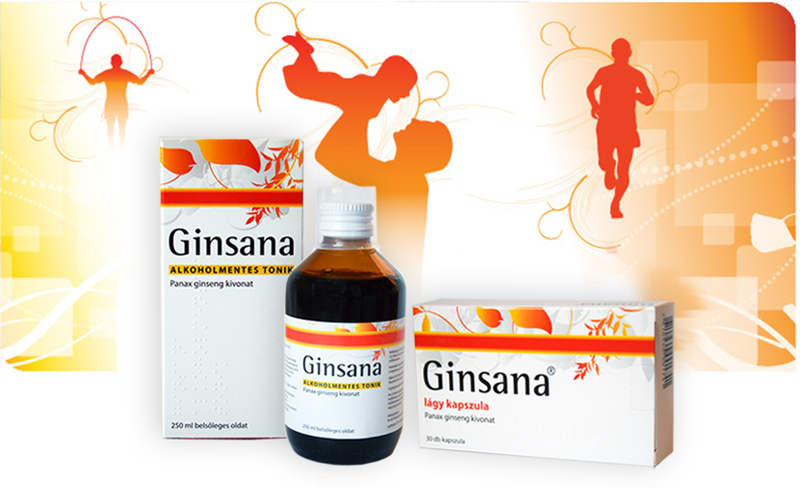 Ginsana® is a traditional herbal medicine, designed for adults who need more energy to face everyday challenges. Ginsana® capsules and tonic contain only natural ingredients and provide long-term energy in the event of weakness and fatigue. Ginsana® - which is made of the highest quality of ginseng – brings back your energy in a natural way. For day or night, for job or fun, from the exhausted manager to the pressured journalist and the tired mothers juggling family life and work. People who need more long-term energy will appreciate Ginsana®. during the period of post-disease recovery. The active ingredient of a capsule: 100 mg standardized ginseng root G115 (Panax ginseng C.A. Meyer, radix) dry extract (4 mg total ginsenoside content) extracting: 40% (V/V) ethanol. The other ingredients are lactose monohydrate, anhydrous colloidal silicon dioxide, refined rapeseed oil, lecithin, partially hydrogenated soybean oil, hydrogenated soybean oil, yellow wax, soy lecithin, ethyl vanillin. Capsule shell: gelatin, 85% glycerol, partially dehydrated sorbitol syrup, black iron oxide (E172), red iron oxide (E172), ethyl vanillin. Capsules: 100 mg of ginseng root extract per capsule. Tonic: 140 mg per dose (15 ml). What is G115® Ginseng extract? G115® Ginseng extract is a medicinal extract made from the roots of Panax ginseng C.A. Meyer. G115® Ginseng extract is standardized. It means that each dose contains the same amount of active ingredient, and therefore the same quality and efficacy is guaranteed for each capsule. Each capsule contains 3.46 kcal (14.5 kJ). Ginsana® can be used as a long-term treatment. The extract does not have any stimulatory or estrogenic effect and may also be used during menopause. For more information, please read the current patient information leaflet on the homepage of the National Institute of Pharmacy and Nutrition. Megjegyzés: A G115® a Pharmaton SA Svájcban bejegyzett, engedéllyel használt védjegye. Note: G115® trademark of Pharmaton registered in Switzerland and used under license. Traditional herbal medicine. The usage of product for indications is based on long-standing use and experience. about risks and side effects! BioChallenge Ltd. H-4032 Debrecen, Nagy Lajos király tér 5. I. 12.